Multinational drills "Clear Sky – 2018" are held at Starokostiantyniv air base in Khmelnytsky region in October 2018. These are the largest and the most ambitious drills of the Ukrainian Air Force with Western allies throughout all years of independence. Participating are the United States, Romania, Poland, Belgium, Denmark, Britain, the Netherlands, Greece, and Estonia. We talked about the importance of this event, as well as the current capability of the Ukrainian Air Force, with one of the drill's organizers, Director of the State Partnership Program for California and 194th Fighter Squadron F-15 Eagle pilot, a U.S. pilot with 20-year flight experience, Robert "Tigger" Swertfager. - You have German ancestors? Why Swertfager? - They settled in California? New-York, actually. My grandparents met in the Second World War. They got married and relocated to California. - How does it feel to travel thousands of kilometers to Eastern Europe, to Ukraine? I mean, where is California and where is Khmelnytsky region? It’s far away in the distance. But, fortunately for me, I’ve been coming to Ukraine for a long time. The more I come to Ukraine, the shorter the distance seems to me. It seems to me like I’m coming to my second home. - Since when did you start? I started coming to Ukraine and making state partnership program events in July 2002. So, for over 16 years now, I have been coming to Ukraine and working with the Ukrainian people. Some years it has been up to 8 trips per year. Sometimes maybe only four. This trip for Clear Sky 2018 marks my 70th trip to Ukraine. - Wow. You’re probably already as Ukrainian as me? Have you learnt something in Ukrainian? Yes. Дуже дякую (thank you very much). Дуже смачно (very tasty). Дякую, будь-ласка (thank you, please). Так (yes). Switches to Russian: "Я говорю по-русски. Я изучаю этот язык, может быть, десять лет" ("I speak Russian. I learned it for ten years"). But I stopped learning Russian in 2014 because I wanted to start learning Ukrainian instead of Russian. To pay respect to the Ukrainian people. Unfortunately, my job’s responsibility has increased significantly since 2014, and I haven’t had enough time to dedicate to learning Ukrainian. But I plan to learn it more in the future. - You’re working focused on Eastern Europe for many-many years, much before the 2014? - Could you predict that your job would turn this way it is now, after 2014? No. I couldn’t. But you know, inside, I’m glad that I’m more involved now. And that we are making more and more projects and we’re getting more attention and funding to accomplish these projects. Specifically, with the Ukrainian air force. Because I truly believe that they had been forgotten and neglected for years prior to 2014. Then, they were extremely involved in the ATO [Anti-Terrorist Operation], at the beginning of the war, but later the Ukraine Air Force abided by the Minsk agreement and stopped flying in the ATO. - Which changes would you point out between that air force that you had seen then and the one with combat experience now? It is a completely different air force now than it was prior to 2014. I think you see a lot more pride in the service. You definitely see a greater attention to detail, the seriousness of their occupation. Ukraine is in an active conflict right now inside the ATO. And tensions to the east have made life more challenging every day for Ukrainians. We deployed to Myrhorod airbase in 2011 with F-16s for the Safe Sky exercise and I have seen so much growth with the Ukrainian Air Force from 2011 till Clear Sky 2018 exercise happening right now. - That was the first time when they landed in Ukraine, right? 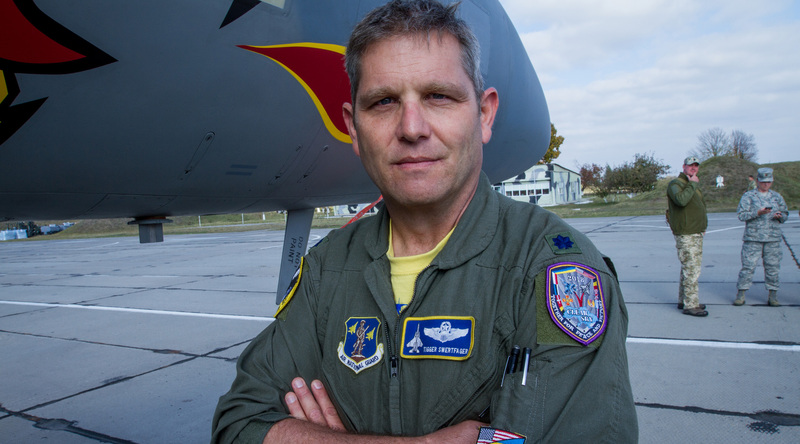 The Safe Sky exercise in 2011 was the first time that we brought U.S. fighter assets to Ukraine and we brought the F-16. There was a combination of Airmen between the California and Alabama Air National Guard units. We had brought jets from Alabama, but California did all the planning. We had a very successful exercise. We had some logistical issues. Language barrier issues, but we were able to lay out a plan and execute the plan successfully. There is a huge difference in complexity between “Safe Skies 2011” and “Clear Sky 2018”. Now, we have almost 1,000 participants. Back than we were just maybe 300 participants from the U.S. Now we have five different major capabilities. Air sovereignty with the F-15s. aero-medical evacuation medical exercise with the C-130. We have cyber exercise happening. We have Para rescue and we have RQ-9s - remotely piloted aircraft - flying out of Poland into Ukraine. We have joint special operations. сер. And then we also have F-16s flying out of Romania and doing “border integrity” with flankers and F-15s. The level of complexity that “Clear Sky” brings, when you compare it to “Safe Skies,” is an astronomical movement forward in capability and complexity. And that allows us jointly to start measuring interoperability between Ukraine’s Air Force and NATO’s Air Force and the United States Air Force. That’s really what our purpose here is. If you compare the “Clear Sky” exercises and their level of complexity with other exercises that the US and NATO has with allies, would you say it already reaches the level the U.S. usually has with allies? Absolutely. I think that if you roll in a deployment or an exercise and you don’t have challenges, I don’t think your improving your capabilities. We had significant challenges here. With our fuel, with customs, with organizing so many partners coming together and getting everybody on the same sheet of music - it is a challenge. But! We’re going to walk out of here all increasing our own job knowledge and our capability. - If we could talk interoperability a bit in more detail. Can you say that Ukrainian Air Forces can already act together with American, Romanian , Polish Air forces? In case of a real conflict? We are doing real training. Not just taking off and doing pretty fly-byes, high speed, and low speeds. We’re not doing that. What we are doing is legitimate training. And exercising our capabilities together. We’re doing dog fighting, we’re doing intercepts. We’re doing things which are normal operations within the United States Air Force. The Ukrainians are accomplishing these tasks with us. There’s always room for improvement. I’ve yet to have a perfect mission. A perfect sortie. As a 20-year-flying-veteran in the US. we don’t expect perfection from anybody. We just expect dedication to getting better and moving the bar, you know. Increasing everybody’s interoperability. I fully realize the challenges. But our expectations are extremely high. And I think this is a significant difference between this exercise and the previous Safe Sky. In the “Safe Sky” it was our first time ever operating with the Ukrainian Air Force and we had no watermark. We had no idea what to expect. Other than our on-the-ground training and discussions. 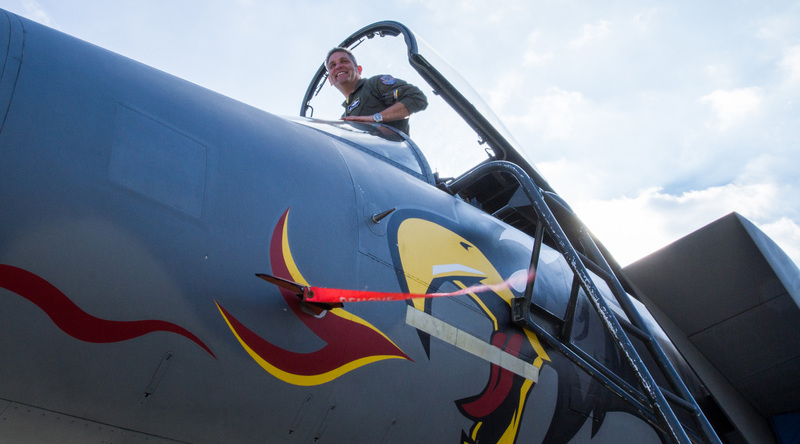 We flew with the Su-27s, and MIG-29th in Myrhorod. We were very surprised how professional and prepared the pilots were and the base was. Our doctrine back then was very different. Ukraine was still flying off the former Soviet Union doctrine. Which is standard for all of the Eastern Union. Poles, Romanians, Bulgarians all were like that. It’s just recently that they’ve started making changes to their doctrines and adopting western-style doctrine. In 2011 we were safe, effective and we accomplished our goal. Which was to share our experiences: the Californian National Guard with the Ukraine’s Air Force on how we do air sovereignty and how we protect large sporting events. You were about to co-host the Euro 2012 football tournament with Poland. Our job as defenders of California was to come over here and share our experiences, our procedures, tactics, our technics and procedures, with Ukrainians and we achieved that goal. Ukrainian Air Force defended each one of the four cities that were hosting euro cup events in Ukraine. To include the championship game in Kyiv that summer. I was fortunate enough to attend some of the Euro 2012 and it was phenomenal. - Usual problem with journalists too. You work at events, you don’t see them. I took 10 days off and many of my colleagues from the fighter squadron came over and we enjoyed it all together. It made us really proud to see Ukrainians take what we had learnt together in 2011 and applying it just a year later. That really inspired us in the California Air National Guard: hey, what’s our next step? 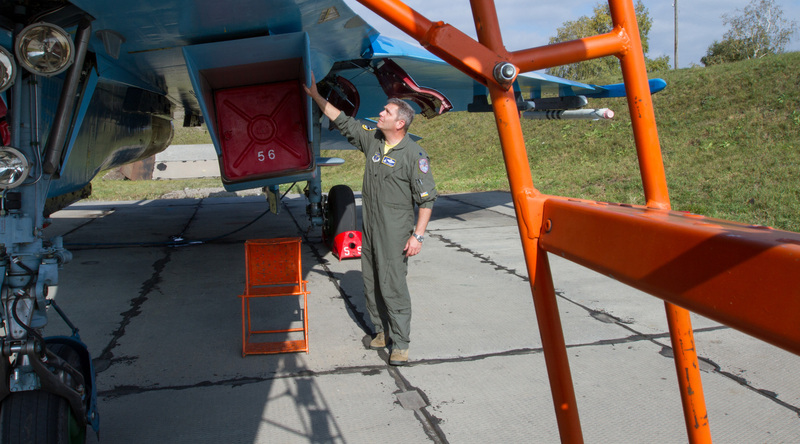 What can we do next to increase Ukrainian Air Force capability? In 2014 when the conflict first started, I was asked to come over and do an assessment with U.S. Air Forces Europe or USAFE. At that time my first arrival was in July 2014. Ukrainian Air Force was still flying, they were still flying until August. I came back at the end of August, that was when they stopped flying operations in the ATO. I remember meeting with General Nikiforov. Vasyl Nikiforov. He’s a mentor of mine. He’s basically Ukrainian Chuck Yeager. He is a legend in the aviation community. He had pulled me aside and said: “hey, what do you need from us to help us start addressing all the allegiances we are having?” The partnership that we had built throughout years with General Nikiforov… he was deeply involved with planning of the “Safe Skies”. I worked with him for just two or three years straight. We had built our relationship, our partnership was built on trust. - I don’t know if it’s ethical to ask, but as far as I understood you were very close friends with him. It was a very, very big loss for you? Oh, it was huge. Huge. I came to visit in July, August and at the beginning of December was my third trip to Ukraine that year. I was told that General Nikiforov was in the hospital in Israel. I was very concerned. His son provided me with his phone number where Vayl’s wife was staying and so I was able to call him in the hospital. He sounded great. He sounded super strong. So I left the conversation very optimistic that he was going to pull through. Unfortunately, a couple of months later I got the horrible news that he had passed. It was a kick in the gut for sure. It was very tough. I wish I could have been here for the ceremony and for his funeral. He was my friend. - Is it a bit of a devotion now to continue what you’ve been doing together? Oh, 100 percent. Absolutely. When in fact we did our first sortie the other day, I was thinking about him. “Wow, General Nikiforov would just be blown away at how far we’ve come”. The level of ambition that we set for this exercise is incredible, and I think it is unprecedented. To make this step in complexity down here where we are right now. It speaks volumes for the partnership that California and Ukraine have together. It speaks volumes for the dedication that Ukrainian Air Force has for improving their capabilities and improving their interoperability with NATO. It’s a clear signal that they want to be able to work with us. - If we come back to this point in 2014, when you came in July and August, what was your impression of the level of technical capability Ukraine had to operate with? Because I remember when we filmed in the East back then, we saw cases when Ukrainian pilots would request when on combat mission that artillery would shell the target - it was the only way they would see it. They had no other equipment to take the target rather than some ground forces physically hitting it and then the smoke would point at the spot. The level of capability that the Ukrainian Air Force was fighting against in the ATO, was extremely well-funded, modern technology, an integrated air system. It is still one of the toughest environments to fly in. And the fact that the Ukrainian Air Force was dedicated to getting their missions completed, speaks volumes of their bravery and their love for their country. And their desire to protect their sovereignty. I spent hours talking to pilots that had flown missions in the ATO. - Could you believe what they were telling you back then? At first I was a little skeptical, but the more our conversations got deep into the events of an actual mission and how it played out, I saw that their tactics were in coming extremely low at that time. Much lower than the U.S. Air Force pilots train, I promise you that. It was a successful way for them to accomplish their missions. And when they seized air flying operations in the ATO, due to the Minsk agreement, I’m just happy that Ukrainian Air Force hasn’t lost any more assets since then. I don’t think that anyone can challenge their commitment to protect their own country. - Comparing the 2011 Safe Skies and 2018 Clear Sky one thing clear is that the political background back then and now is totally different. Now there’s a simmering war with Russia going on. Does this current exercise right now send a message? And which message is that in this context? Well, first of all I think it sends a message that the United States believes in the international law, in territorial borders, and stays committed to assisting Ukraine in developing themselves so that they can maintain their borders on their own. And also, I think that it creates stability in the region, because Ukrainians are now working with Romanians and the Polish and their forces are working together. Guess what? Communication doesn’t stop next Friday when the exercises are over. We develop relationships and we continue to foster those relationships. Pilots love to talk flying. I have numerous pilots that I keep in touch with - from Ukrainian Air Force, from Romanian Air Force, from the Polish Air Force. For the Poles, from 2011, we still keep in touch with them, we were stationed in Romania for three months in 2016. And now we are back in Ukraine. I really like putting all these people together. We have a very strong camaraderie. - Mentioning on the changes that were made in the last years. I know you had an opportunity to also watch some of the leadership of the general staff and some of the highest military command of Ukrainian armed forces. Who have all changed too since 2014. What was and is your impression of them? The General Staff - I had an opportunity to start engaging with them because of my position in the Californian National Guard. And now I work in the J5 which is strategic planning. And I’m the director of the state partnership program for California. We have two partners. Our first partner is Ukraine. Our second partner that we received 7 years ago is Nigeria. Also, a very interesting and wonderful place to work. And so I manage those two relationships. And being in this position, it has allowed me to travel with our and to attend higher-level meetings with General Muzhenko. And now we have an Air Force representative at these predominantly army-centric meetings. And you know fighter pilots. We’re tough to keep quiet. I always advocate on behalf of Ukraine’s Air Force. Not just because I’m an Air Force guy, but because I think it’s in the best interest of Ukraine to pay attention and invest in its air force. You have to look past the current situation and politics. A lot of the investment that went in the ministry of defense after the ATO began, was predominately given to the ground forces investment. Which makes sense. That was the crisis at that time. Especially after the Minsk agreement when the air force stopped flying, right? Ukraine needed to bolster its ability to fight on the ground. I really get that. However, when you start looking at the long-term strategic plan, you don’t want your land forces... when the ATO thing ends at some point, and it will end at some point, you don’t want an August 2014 Air Force to be in place. You’re gonna want an Air Force that is, you know, 2019. Or 2020. Whenever this conflict ends. And they turn a page and it’s a different world climate and it’s a different world situation- then you want Ukrainian Air Forces to be on par in that situation. So this exercise isn’t a direct response or any coordination with the conflict in the east and the Donbas situation. This exercise is bringing Ukraine to peer standards with their Eastern European neighbors. Therefore, it identifies, how professional they are, worthy of investment, that they are going to spend the money they’re invested wisely and we want to continue to build upon this event on the future. And I fully expect Ukraine to get invitations to exercises in Romania and Poland. And that will be your next step. In California we are experts in deploying. We moved everybody here. Now the logical step is to come in and share some of our lessons learned with this deployment. So that Ukraine can pick up their Air Force and make it deployed in Romania next year. Take a squadron of MiG-29s, or SU-27s, SU-25s, SU-24s, AN-26, and move their forces down there to support a regional exercise with their neighbors. - Can I ask why your callsign is the way it is? - Yes. For a Ukrainian speaker it looks like “tiger” but surely it’s not, I guess. - Yes, sure. But maybe you could share a small demo, like a preview, with our readers? One time I engaged my last cannon on my F-16, when I should not have. So they were going to call me like “an itchy trigger finger “. It’s the same in the US. Like a gun fighter. If he has an itchy trigger finger, he's gonna shoot first. And then ask questions later. It was a joke. And they said, “Oh cool, trigger, it’s such a great name. Awesome”. I usually have very open friendly positive attitude. So someone in the squad said - hey, let’s not call him “trigger”, or at least let him think we're gonna name him “trigger”, but we’re gonna name him “tigger”. Who’s like a cartoon character. Kind of a Goofy. Friendly, for sure... Bounces and bounces all over the place! Anyway, when I got my callsign, and it was “tigger” not “trigger,” I was surprised. But my family liked it. My daughter’s loved it. And it stuck – forever! - If you could address the Ukrainian people through this interview, all those Ukrainians reading it, what would you like to say/tell them? You should be extremely proud of your Air Force and how committed they are to defending the people of Ukraine. They’re extremely capable, professional, they’re on par with your neighbors in the region. (If) they keep this attitude and dedication up, they will be one of the premier forces in the Eastern Europe. I fully believe that. I’ve seen the growth from 2002 to 2011 to 2018. Over 16 years the capability improvements are distinct and commendable. 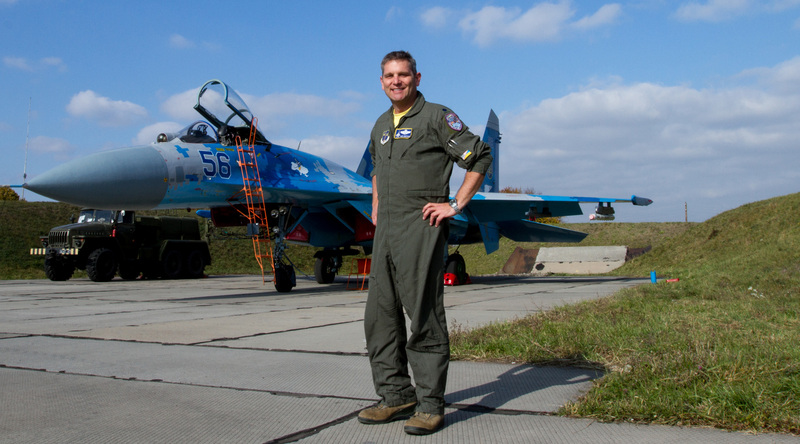 Just after the interview was published, we received tragic news on a catastrophe that had happened to a Ukrainian Su-27 aircraft over Vinnytsia region, while it was conducting a combat-training flight. Ukrinform offers its deepest condolences to relatives, close ones and combat comrades of the aircraft’s late pilots. Let us also express our deepest respect and gratitude to people who risk their lives for the sake of safety of Ukrainian skies.